You don't normally associate a polar-class expedition ship with beauty but PolarQuest's M/S Stockholm is a gorgeous vessel that cuts quite the figure. With its deep blue hull, warm pine decks and brass detailing, it's not a cookie-cutter ship that will fade into memory. 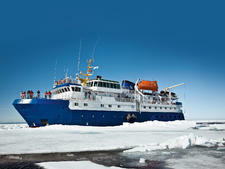 This ship -- and its Arctic itineraries -- will stand out in your mind. Originally built for the Swedish National Maritime Administration in 1953, it was completely refitted in 1999 before segueing into the life of a polar region expedition vessel. With just six outside twin cabins outfitted with bunk beds on the Main Deck, the ship can accommodate 12 passengers. But, you won't spend very much time in your cabin. Since the ship is so intimate, you'll get to know your fellow passengers and crew quickly, and you'll spend your time on deck or on a shore tour that promises an up-close and personal introduction to the Arctic via Svalbard or other nearby destinations like the Norwegian fjords, the Hebrides and the Orkney and Shetland Islands. Cruisers should be fit enough to get in and out of a Zodiac since that's the method of transportation during shore excursions. All six cabins are located on the Main Deck. Each is a twin outside stateroom with bunk beds and portholes. Each cabin has a private bathroom with shower. As for bath products, you'll only find hand soap in the cabins, so be sure to bring everything else you might need. Electrical outlets are 220v, and there are no USB outlets in the staterooms. There is a hair dryer in each room, but you won't find a TV. That's because there's no reception in Svalbard, where the ship spends most of its time sailing. Internet isn't available onboard either. In addition to all meals and beverages (including wine and beer), the cruise fares include the services of an expedition leader and a guide. All onboard talks and shore excursions are included, as are tips. You'll get comprehensive reading material to dive into before the voyage and a post-expedition illustrated log. Some Svalbard itineraries include a pre-cruise hotel stay in Longyearbyen. The Norwegian Fjords, Bear Island and Svalbard voyage includes a hotel night in Bergen, and the Hebrides with St. Kilda expedition includes a pre-cruise hotel night in Glasgow, Scotland, as well as a transfer from Glasgow to Oban upon your return. 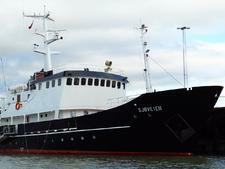 Breakfast and lunch aboard M/S Stockholm are buffet style. The morning meal generally consists of bread, cheese, yogurt, muesli and porridge. At lunch, there's one main dish plus sides. A three-course meal is served a la carte at dinner. Throughout the day, you can get coffee, tea and hot chocolate; cookies are served in the afternoon. Room service is not offered. Special dietary needs can be accommodated, but you must make arrangements with PolarQuest before the voyage begins. Certain itineraries include complimentary wine and beer with lunch and dinner. For travelers looking to visit the Arctic, PolarQuest offers two itineraries on M/S Stockholm: the seven-night Svalbard Adventure and the 10-night Exploration of Svalbard. For an expedition that includes the Artic and more, consider the 14-night Norwegian Fjords, Bear Island and Svalbard itinerary. M/S Stockholm also offers itineraries like the five-night Whales and Northern Lights in Northern Norway, the seven-night Hebrides with St. Kilda and the 10-night Orkney and Shetland Islands voyages. PolarQuest doesn't include gear in its cruise fares, so bring along the appropriate hats, gloves, footwear, parkas and binoculars. The onboard languages are English and Swedish.